Last night, when the kids made me stop fast forwarding so they could watch an ad for the new movie, The Lorax, but instead we discovered a car commercial, I was sure that Dr. Seuss (Theodor Geisel) must be rolling over in his urn. There he was, the modern cartoon Lorax, romping through a car commercial in an untouched Truffula forest, without a hint of irony. While searching for a clip of the commercial I discovered that several people had beaten me to my rant, including this article, Is the Lorax Really Just Hawking Big SUV’s? at The National Post. The Lorax has been one of my favorite Dr. Seuss books since I was a budding environmental scientist, collecting frogs at the age of six from the corn field ditch in my back yard. For those of you that are not familiar, Seuss’ classic clearly refers to a bad guy, the Once-ler, in search of fortune, who cuts down every last Truffula tree in the forest to be made into a variety of unneccessary consumer goods, converting the land from fairytale to wasteland, forcing several dependent species to relocate or die. The Lorax has been accused over the years of being “anti-capitalist” and “blatant indoctrination of children,” and perhaps rightly so. But would Dr. Seuss approve of the Lorax appearing in a car commercial, even if that commercial mentions fuel economy? We can’t ask him, but if you read The Lorax yourself, I think you’ll agree that this beloved author would be very disappointed. 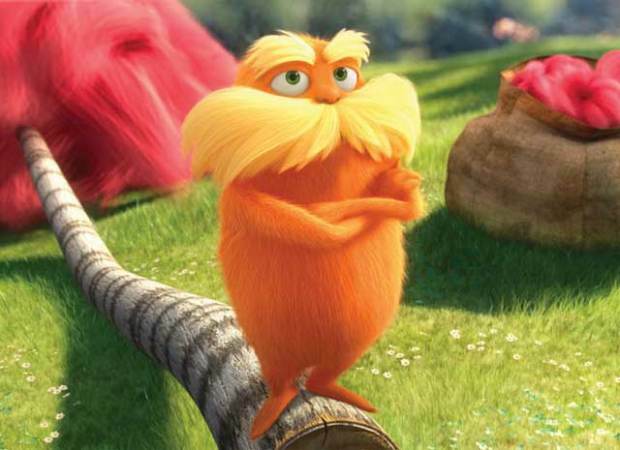 Why couldn’t the Lorax appear in commercials for taking the bus or riding bicycles, for energy conservation, or alternative energy like solar or wind power? The answer is $$. None of these environmental ventures spend (or can afford) that kind of bank on marketing the way car companies do, so the environmental movement is destined to be helmed by certainly less recognizable and dynamic cartoon characters. A part of me is really torn on this issue. My grandfathers and my sister worked for car companies in Michigan before the jobs moved to Mexico and other countries. But if I’d written a book with as much staying power and clear message as The Lorax, leaving it behind among my greatest works for the world to appreciate some twenty years after my death, only to have its core message and ideals polluted (pun intentional) for financial gain, I think my ghost would haunt these folks who truly missed my point with Paranormal Activity proportions. I will definitely watch the newest remake of The Lorax with my kids, at home on DVD, where we can fast forward through the commercials (for things other than movies that now grace even DVDs), and pause to discuss the global significance of Seuss’ story. Is it brainwashing? You betcha. Just like learning about Dr. Martin Luther King’s message. If we don’t learn from our past mistakes and make better choices in the future, we won’t have any natural resources left to fight over. But please, don’t take my word for it. Reread The Lorax and decide for yourself. One of my writing mentors, Christina Katz suggests cataloging your accomplishments before setting goals for the new year. Give this a try before setting your New Year’s Resolutions. I joined a critique group and connected with at least 4 other writers in my town. Some of them are in my blog roll to the right. I’m sure there are a couple that I missed but that feels like a lot of success for one year. Looking ahead, I came up with these goals for 2011. Please let me know if you would like to help me acheive any of these aspirations. I hope that your year has been as productive and rewarding as mine and that you will achieve any goal you attack in 2011.